I have an existing strawberry patch that hasn't done well in 2 years. I want to transplant to start a new patch. Am I able to do that this fall or do I have to wait until next spring? Thank you. 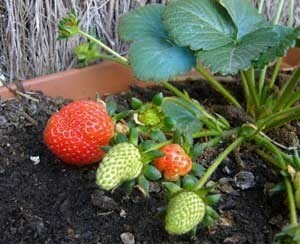 To get the best yields next year, the best time to transplant strawberries is in the fall (late August and on). Transplanting in the spring is your second best option. You can transplant your strawberries now, providing you keep them well watered, but it will be much harder on the plants than if you wait until the fall. When transplanting, relocate them to a sunny location (a southern exposure is ideal) with sandy/loamy soil, and a pH of between 5.5 and 6.5. Make sure the area is completely free of weeds before transplanting. Avoid low spots, poorly drained areas and sites where raspberries, tomatoes or potatoes have been grown recently. Dig up as much of the plant's roots as possible and cover the roots with damp sphagnum moss to keep them moist while transplanting. Water each plant as you are transplanting them rather than watering them all at once from overhead when you're finished. Keep the transplants moist (not wet) throughout the season and until your first frost and then discontinue watering them. Choose plants that are younger as well as rooted runners for transplanting. These plants are more likely to give you better yields next spring. Avoid relocating plants that appear unhealthy and remove any flower buds, runners or damaged leaves before transplanting. If your current beds are older than 3 years, it's likely that they are falling off in production naturally and you may want to consider just starting over with new plants next year. I have transplanted strawberries at all times, even in the middle of summer; they just needed to be watered constantly. I do prefer to transfer in the fall so that they have time to get established before the next spring. My brother in law had a friend who had a commercial strawberry operation. He said they always transplanted (and planted) in the fall because then the plants will produce the next spring/summer.